When she's not around, it sometimes feels like she leaves rainbows for me to find. My friend Jenna McGuiggan is hosting a month of prompts over on Instagram to inspire people to begin to write little snapshots of a process she calls the One-Moment Memoir. I've been having so much fun with these one-word prompts and exercising my writing muscle in a different way, thinking about capturing a moment with a photo and then telling a very small story about it in the description on Instagram. This simple ordinary act of reading at night ties her childhood to mine to his and to so many of you. One day maybe she will read to someone small and think about these ordinary moments with us and she will have this glimpse of knowing how much we love her. Using my grandmother's bread cloth tonight. It's been in a drawer and then a box since she died almost ten years ago. My mom gave it to me when we visited her at Christmas. Tonight, I think about my grandmother's hands ironing this cloth and then baking, carefully wrapping, and serving rolls or bread, and I miss her so deeply. But the missing is softer and with a new sort of rhythm, a new sort of breathing that begins deep in my belly instead of catching around my heart. 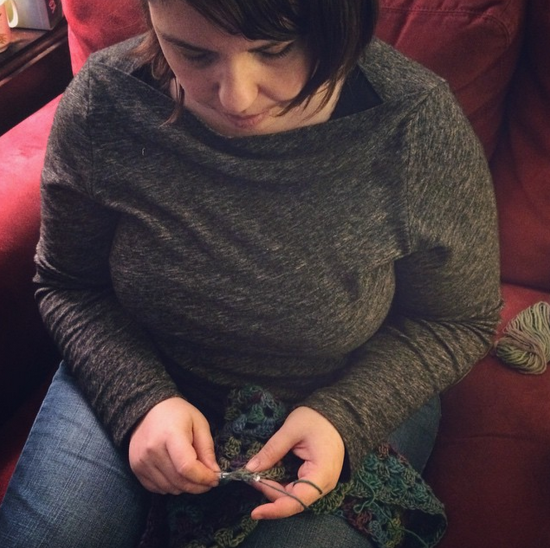 The rhythm of stitch after stitch takes me from frazzled to centered, from there to here. It becomes the gift within the making, the giving. I was lucky enough to dive deeper into Jenna's process and take a sneak peek class of the one she's offering this Saturday. As Jenna explains, "One-Moment Memoirs is a series of writing exercises designed to help you discover and write the stories of your life. This hands-on workshop will help you take a relaxed, yet focused, approach to telling life's big and small stories in bite-sized pieces." The exercises she shared in the class helped me to come up with new angles on stories I've been wanting to tell but haven't quite known where to begin. I'm excited to share those stories here soon and maybe even in the second book I'm gently pushing myself to get back to writing. I highly recommend her course. It's a virtual course, but it's going to run live this Saturday and it is going to be awesome! And if you can't attend live, you can still sign up and receive all the course goodies + recordings so you can work at your pace. Find out more here.